It's been pretty quiet here at LHC@home we've been working behind the scenes to streamline the server and keep the code as up to date as possible. There has also been some work on the update of the SixTrack application which we hope to roll out soon. The news with the LHC itself since the set back last year is quite good with it running at 3.5TeV this year. The experiments have also been busy with ATLAS and CMS and LHCb and ALICE working on refinements during the downtime. Will BOINC credits for SixTrack count towards LHC@home Classic or is it regarded sepereate to both LHC@home classic and 2.0? lhc@home was seperate from sixtrack. Sixtrack is LHC@home 2. It looks like they are all now combined at this URL. The old url to LHC@home gets redirected to sixtrack now. There is currently a small amount of work on this project, for those that are interested. I don't know why, but I thought Dingo's earlier post was about more LHC work. :hbang: So I didn't bother posting about it. Gee I wish they'd fix the sixtrack WU's!! Trying to boost my position with LHC is frustrating. You either don't receive the WU's or they have now a validation issue. I have over 400 WU's now either inconclusive or pending! AussiePete, you must feel my pain too? 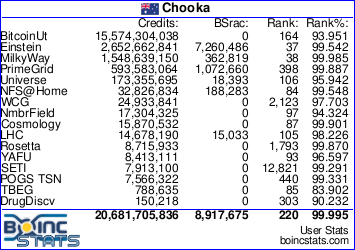 WOW Crackenback....you are on a mission to SMASH out the LHC work!!! The collaboration meeting is the most important event of the large collaboration, led by CERN, that is designing and building the High-Luminosity upgrade of the LHC. This is not only a forum to present and discuss recent results, but also an event that inspires new ideas and studies. Therefore, we would like to announce that in few weeks we will be back to you, counting on your usual fantastic and essential support, to launch new simulation campaigns! Alessio and Massimo, for the SixTrack team"
PS: IMO the two PDF's on HiLumi are well done and worth reading. It would be great to get more LHC work. Yes more work would be nice for 6track. wow...the team just got a lot smaller with LHC's stat export permission thingo.